Reigning US Amateur champion, Gunn Yang, has confirmed that he will return to Melbourne to compete in the Asia-Pacific Amateur to be contested at The Royal Melbourne Golf Club starting 23 October, 2014. Yang, who played for Kingswood in their winning 2011 Division 1 Melbourne Pennant team and is currently attending San Diego State to apply his skills in the US collegiate system, will spearhead a strong Aussie contingent who have accepted tournament invites. “I have such great golfing memories back in Australia and especially of my favourite golf course, Royal Melbourne Golf Club,” said Yang this week from his US base. An Australian contingent of ten this week accepted invitations to play the Asia-Pacific Amateur Championship. Among the group is 16-year-old Ryan Ruffels, the reigning Australian junior champion who in July won his age group at the Callaway Junior World Golf Championships in the US and last week represented Australia at the World Teams Championship in Japan. “It’s pretty special to be playing a tournament here in Australia, where if you happen to play well for one week you’ve got a trip to the Masters secured,” said Ruffles. Other Aussies to accept invitations include Jarryd Felton, 19, winner of numerous local titles including last week’s Mandurah Amateur, NSW Amateur and Tasmanian Open; Cory Crawford, 22, winner of the Malaysian Amateur; Geoff Drakeford, 22, the 2014 (US) Porter Cup champion; Lucas Herbert, 19, runner-up in the individual standings last week at the World Amateur; Curtis Luck, 18, the top Aussie at the US Amateur last month in Atlanta; Taylor MacDonald, Anthony Murdaca and Todd Sinnott. Last year at the Asia-Pacific Amateur championship three Australians finished in the top-10 as Korean Lee Chang-woo won the title at Nanshan International Golf Club in China. Lucas Herbert was the highest-placed Australian after a final round 3-under par 68 moved him into a share of fourth place at 3-over par for the championship, six strokes behind champion Lee. 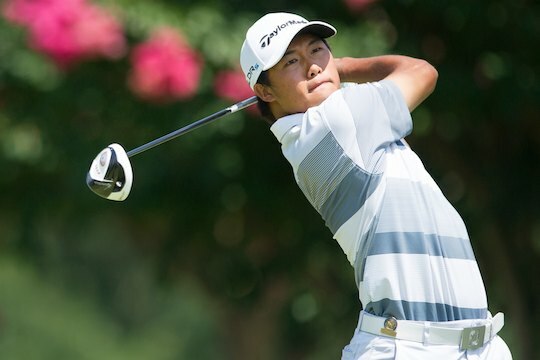 Also looking to reclaim another title is 16-year-old Chinese superstar Guan Tianlang, who won the Asia-Pacific Amateur Championship in 2012 and played in the 2013 Masters at just 14 years of age, the youngest competitor in the history of the Tournament. With a field of invited players capped at 120, these championships are the biggest amateur event to his the Australian shores for some time and it promises to be a great event showcasing the world’s best amateurs on one of the world’s best layouts – Royal Melbourne. The Asia-Pacific champion receives a place in the following year’s Masters Tournament and, along with the runner(s)-up, a berth in The Open Qualifying Series for The Open Championship the next year.